On heels of the solemn passing of New Zealand's native son; Sir Edmond Hillary, his gnawing spirit for uncharted knowledge continues to thrive. With hungry hearts and hungrier appetites a group of seekers, dreamers, and above all researchers, reflect on the a unique singular passion that allows these law-abiding bill-payers to still have an excuse to wonder, dream and perhaps someday even discover. Meet the Members of The Bigfoot Researchers Lunch Club, BFRLC for short. They meet twice a month and two weeks a year, in the pursuit of discovery. 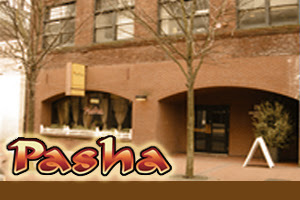 This week they find a great Mediterranean place called Pasha, located near the corner of NW 5th and Burnside, Persian cuisine and culture are the highlights at this restaurant which offers lunch buffets, live music and dancing, hookah and catering. Minted potatoes and stuffed grape leaves were particularly popular among BFRLC members. The fine persian detail on the furniture and eclectic middle-eastern decor underlined the undeniable sense that somehow, unknown to us, an unfamiliar course had been plotted--and better yet we were all stowaways. The mix of anxiousness and apprehension was expressed in every word and gesture communicated and shared among BFRLC members. The unanimous vote of the official not-so-secret handshake, field research site suggestions, theories to pursue, and tons of confirming rocking "yeah!" moments were tossed and juggled like chines acrobats simultaneously tumbling over and under each other without collision or misstep. Before we realized it, the hour had slipped away, and lunch was almost over, the conversation had turned to reflect on Sir Edmond Hillary. Although there was plenty of opportunity, at this point during the lunch, to focus on things ending I think I can speak for us all when I there was really a sense of "what have we begun?" BTW, you can check out the location of every BFRLC location on this Google map.